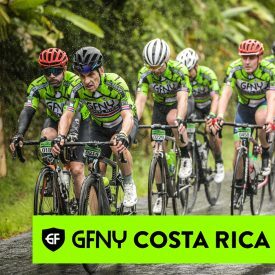 (NEW YORK CITY, April 26, 2018) – The city of La Fortuna rolled out a warm welcome to riders and families at the inaugural GFNY Costa Rica last Sunday, April 22. La Fortuna is among Costa Rica’s top tourism attractions. The stunning GFNY course took place among rich, lush green trees, flowers and plants with views of the lake, windmills, various wildlife conservatories, and even a rainbow. On a rare wet April day, the predicted typical dry tropical conditions were replaced with cooling rain and the Arenal Volcano cloaked in clouds. The conditions definitely provided an unexpected unique challenge and respite from the sun’s intense rays. It was a welcome relief to cool the riders from 16 nations whose spirit never faltered throughout the day. The first 14km was uphill. By km2, the peloton had substantially slimmed down and by km10, the lead pack consisted of 15 riders that all had the potential to take the win. As the race developed, Adrian Bonilla attacked and found himself out alone with no support. Behind him, as riders approached the technical 1km-long gravel section, three riders, 6-time Ruta de los Conquistadores winner – Federico Ramirez Mendez (CR), Mario Rojas Espinoza (CR) and Carlos Arias (CR) made a break and chased Bonilla, eventually catching and passing in the uphill gravel section. After completing the gravel section, Espinoza dramatically took a fall but immediately got back up and chased Mendez and Arias back down rejoining them at the front, all the way to the finish line. It was a dramatic sprint finish in the end, with Mendez edging out Espinoza by one second in a sprint finish in 4:25:51. 18-year-old Arias rounded out the podium less than a minute back. In the women’s race, Costa Rica also dominated all podium spots. In the same fashion as the men, the ladies’ race ended in a sprint finish, with Marcela Rubiano edging out Natalia Navarro by one second to take the win in 5:23:33. Eunice Rojas was third in 5:37:52. 10% of finishers in each age group in the long route will qualify for the Racer Corral at the 2018 Campagnolo GFNY World Championship in NYC on May 20th.